Displayed below is my second attempt at a set of navigation buttons for the future Clear Helper Web site. They were created using the guidelines and tests discussed in my post about the first draft of two sample buttons. I am open to constructive criticism and/or suggestions for alternative versions. Each button will appear on a page only if relevant. For instance, if the succeeding page is for a tutorial, the following three buttons will appear as content options. They are intended to represent the content versions of text; pictures and text; and video. The following two buttons, for back and next, will appear, for instance, only if tutorials have multiple pages. The home page button, below, will appear on every page. Upcoming buttons will include two for switching styles from “Standard” to “Easy”. I have an idea for how to represent these concepts in a concrete way. That will be the subject of a future post. TechMatch is a free, Web-based assessment tool that matches people with cognitive disabilities to computer technology. It was produced by Personal Technologies, LLC, apparently also known as Life Technologies, LLC. This is the same company that makes CogLink, e-mail software for people with cognitive disabilities, which I previously reviewed. The TechMatch Web site does not meet accessibility standards, as is indicated by many images with missing alternative text. Its tool, an assessment questionnaire, is not designed to be used directly by people with cognitive disabilities. Instead, it is intended to be used by the people who care for and about them. The company promotes TechMatch as offering “…clear and straight forward advice about the strengths and weaknesses of each potential technology…”. It says its tool, which is a questionnaire, assesses factors of six areas affecting successful computer use by people with cognitive disabilities. (The tool lists actually only five areas of questions.) When completed, it produces a summary of the advantages and the disadvantages of each computer technology for the person being assessed. To access the questionnaire, the TechMatch Web site requires visitors to create a user name and a password. It also requests personal information, i.e, first name, last name, postal code and the visitor’s role in relation to the person being assessed. Upon submitting the information, a verification link is sent to the e-mail address used. No explanation is provided on the log-in form about why the questionnaire can not be completed anonymously. electronic devices and computer technologies the person uses; the difficulties experienced; and the related activities in which the person does and wants to engage. There are also questions about Internet use. the types of environments in which the person visits and lives; the level of comfort using computer technology; and the type of related support available to the person. eye and hand coordination and use; the ability to carry and to use objects; and reading ability. the person’s ability to plan; to learn; to follow instructions; to concentrate; to remember secret names and passwords; and to protect computers from accidental damage. the person’s financial capability to buy computer technology; attitude for and motivation for new challenges; and general feeling about change. The end result was a report of suggestions for generic computing technologies: netbook, laptop, desktop, cell phone and public computing. The remaining item on the list was Pack Drive, the company’s own product. It is a USB Flash drive containing Internet applications designed for people with cognitive disabilities. An option is provided to print a comprehensive report. Choosing it produces a form. The evaluator’s contact information is requested, along with personal information about the person being evaluated. This includes age, date of birth and medical diagnosis. On the form, there is a statement that the information is for inclusion on the printed report only, and will not be saved in any way. To me, it is too risky and unnecessary to provide such information simply to obtain a comprehensive report. The privacy problems are concerning. The site has no standard privacy statement. On its sign-up form, there is not even a simple statement that the entered e-mail address will not be sold or used for marketing purposes. TechMatch’s goal for its assessment tool is admirable and shows promise. It may be useful for those who do not know much about computer technology. Yet its table of computer technologies lists only six generic options. From this, I suspect no others are suggested by any of TechMatch’s reports. That there are so few, and that they are so similar, seems to me to be a distinction without much of a difference. I had expected reports would choose from a database of devices and software that were related to computer- and assistive technology. These databases, e.g., AbleData, already exist. Had the assessment been tied to such a database, it and the effort to complete it certainly would have been more useful. TechMatch development was funded through NIDRR grant #H133S070096. No endorsement of TechMatch, Pack Drive, their manufacturer, or any of its products is intended or implied. The Newham Easy Read Web site is intended for young people with intellectual disabilities transitioning from school. From its copyright statement, it appears The Rix Centre designed it. The site’s accessibility statement claims compliance with WCAG-AA guidelines. I used a couple automated accessibility-checkers on a few randomly-chosen pages. Compliance was indicated. Much of the site’s design is intended to make it accessible and usable by people with intellectual disabilities. The site’s template is bright with lots of imagery. Its layout is fairly simple. The top part of the home page is pictured below. Note: There is a glaring oversight on the home page. In its primary-content section, neither the photographic buttons nor the link text can be clicked to advance to subsequent pages. On the left of the site’s pages, there is a column of links to its sections. Links are accompanied by a small, contextually-relevant photograph or cartoon, and by a short statement on the number of links to be found in each section. This is a nice feature that indicates how much content each section contains. Several links open other Web sites. This is hidden by a Newham Easy Read frame. The frame provides some consistency in the look and feel, but its function is purely cosmetic. Navigation through the site is accomplished via the column of links and by a breadcrumb menu at the tops of pages. There is a basic site map that can be reached by a link at the bottoms of the pages. There is also a site search feature, but it does not work well. For instance, entering the word “accessibility” does not produce a link to the site’s accessibility statement. There is no information, at least that I could find, about what makes the site’s text easy to read. Pages generally have a few short sentences matched with large photographs. Oddly, it is the home page that probably has the longest sentences, including one run-on. This does not make for a good first impression on the nature of how easy the site’s text is to read. Much of the site’s text, particularly for navigation, is tiny. The current accessibility recommendation for people with cognitive disabilities is to use a large font size by default. The site’s accessibility page refers to a text-enlarging readability menu on the right side of every page. Unfortunately, there is no such menu on the right side of every page. The accessibility page does have instructions on how to use the keyboard to increase font size. However, the instructions themselves use the tiniest font size on the entire site! In sum, it is obvious the designers incorporated accessibility- and usability features for people with intellectual disabilities. It is equally obvious that much work has to be done to make the site work better for them and for all visitors. I created a plain-language version of the Clear Helper home page. It displays “standard” text. Clicking the link “Easy” at the top, right of the home page displays the plain-language version. The image below shows the menu. This is my first attempt at creating a plain-language version. I focused on accomplishing it technically. This is a follow-up to my previous post, “Using Plain Language for People with Cognitive Disabilities: Discussion, Example“. The method I used to create two language versions of the same page is to include all of the text content in it, but hide from the user one version or the other depending upon which the user selects. I used the CSS “display” property with a value of “none” for this purpose. It may be more efficient to use a database-driven system that stores and displays the content depending upon user selection. There are content-management systems (CMS) specifically designed to create accessible pages and that have accessible content-management interfaces. One such example is Webcredible’s Accessible CMS. created a MP3 audio narration of the plain-language version. investigating whether or not Webcredible’s Accessible CMS or one of its competitors has the capability to switch between two content versions of the same page. A research study was published in 2007 that used behavior modification to teach people with autism and intellectual disabilities how to access Web sites. After training, participants (N = 3) were able to access specific Web sites independently. Press the computer power button. Press the monitor power button. Place hand on the mouse. Move the cursor with the mouse until it points to the Internet Explorer® icon. Double click the Internet Explorer® icon. Move the cursor with the mouse to the Google® search box. Left click in the box. Type in the search topic of interest. Place hand back on mouse. Move the cursor with the mouse down to the Web site of choice. Note: Steps 12 & 13 should say “Web site link”. To teach these steps, the behavior-modification techniques of backward chaining, errorless learning, and most-to-least intrusive prompting were used. After completion of each step, whether prompted or unprompted, participants received edible items as a form of immediate reinforcement. Participants were also given five minutes of their preferred Internet activity after the completion of the last step. Subsequent to training, the three participants were able to complete all thirteen steps independently. They were also able to take the skills they had learned on the test computer, and apply them to a different computer. I am keenly interested in teaching people with intellectual disabilities how to use the Web. They can not if they don’t know the first thing about it. This research study taught people the rudiments. My interest in it coincides with the intended purpose of the initial tutorials to be presented on the future Clear Helper Web site: to teach people with intellectual disabilities how to use the Web, specific Web sites, and/or features of them. Because the tutorials will be entirely Web based, the level of training used in this research study will not occur. The consequential indication is that people who require such training may not be able to take advantage of the Clear Helper tutorials. It is a disappointing reality. Jared Jerome, Eric P. Frantino, & Peter Sturmey (2007). The effects of errorless learning and backward chaining on the acquisition of internet skills in adults with developmental disabilities. Journal of Applied Behavior Analysis, 40, 185-189. Retrieved from http://www.ncbi.nlm.nih.gov/pmc/articles/PMC1868816/. PDF of the article. Previous posts have discussed switching between two accessible versions of the same Web site. The version for people with cognitive disabilities would not show secondary content such as columns of links and image-based advertisements. Instead, it would only show primary, textual content and contextually-related imagery. This is well and good from a design perspective. However, a Web site’s primary content can be as confounding to people with cognitive disabilities as a cluttered design. Text must be written in plain, simple language. There are efforts all over the world to encourage the use of plain language for everyone. See PlainLanguage.gov (U.S.), Plain English Campaign (U.K.) and Plain Language Association International (world). So, though this problem is not unique to people with cognitive disabilities, they are put at a particular disadvantage because of the nature of their disability. For the future Clear Helper Web site, I would like to have two content versions: one with standard language and one with a lower readability level. Future posts will discuss how this might be accomplished technically. There is at least one Web site that enables users to switch between two language versions: one for “Standard” English and one for “Easy” English. It is of The NSW Council for Intellectual Disability in New South Wales, Australia. Clicking the “Easy English” button on the home page produces a welcome message with instructions on how to use the site. As users navigate through the pages, each can be switched between the two language versions via buttons at the tops of the pages. The menu for the standard fact sheets has relevant images, but they are not clickable like the links below them. All of the “Standard” English fact sheets are Web pages, but all the “Easy” English ones are PDFs. Browse Aloud, which is available on the site, can read PDFs. Yet counting on users to have it and a PDF reader installed seems like an unnecessary complication. The “Easy” English welcome page requires visitors to use the “Contact Us” tab at the top of the page because the “Contact Us” text referencing it is not clickable. Despite these minor quibbles, I think it’s great that the Web site provides two language versions, one targeted to people with intellectual disabilities. I soon will be attempting the same. Mencap is an advocacy- and service agency for people with intellectual disabilities living in The United Kingdom. It also has a service to produce “Easy Read” content. Its primary Web site, Mencap, is designed for the population it serves. It has a newer site that is too, and which targets teens with intellectual disabilities. This review is about the latter. 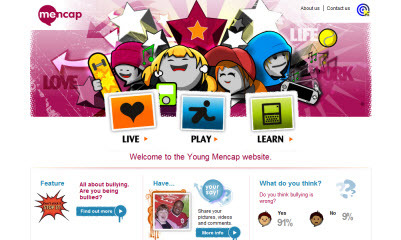 The home page of the Young Mencap Web site, pictured below, exemplifies its bright, colorful look. It uses cartoon- and photographic imagery. Three big buttons, front and center, present content choices. The Web site’s development and testing were led by a group of young people with intellectual disabilities, aged 14 to 19. It has the following accessibility- and usability features for that population. videos with simple controls and accompanying instructions on how to use them. Unfortunately, the site has its problems. Its text-to-speech feature is broken. Even if it were working, its activation button (top, right of each page) does not indicate what it does. Its videos do not use an accessible player, and are not closed-captioned. There is no integrated method to enlarge text size, nor are there instructions on how to do so using Web browsers. Its accessibility statement is simply written, but mentions only two such features. It has minor accessibility errors on every page I tested. I hope I can design a site as attractive as this one. I do like the site’s usability features, and have learned from them. Note: I found the Mencap Web sites through a referral from Inclusive New Media Design.